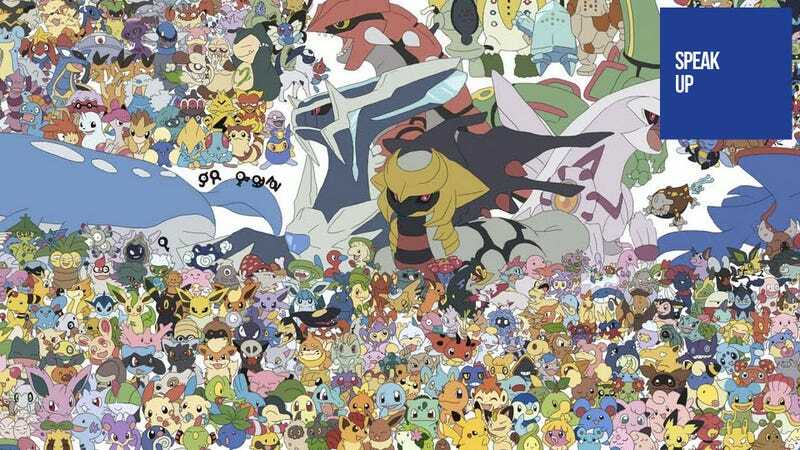 Remember back when there were 151 Pokémon and you knew everything about each one? Commenter Daemon_Gildas does, and he wants that feeling back in today's Speak Up on Kotaku. So, lord knows I love me some Pokémon, but... anybody else feel like they need to hold off on making new Pokémon, and instead on fleshing the current ones out a bit more? Speaking purely for myself, I'd love to see Red/Blue remade for the 3DS, but with full 3D models, perhaps even a 3D world, and maybe even a customizable character. Drop the whole "EV's/IV" thing (or at least IV'ing), possibly do away with Genders/Breeding, and just focus on establishing the ones you already have; maybe the initial 151, and select Pokémon from later in the series. At this point, I can't summon the enthusiasm to care about another 100+ Pokémon, because when you've already got 450+ to choose from, you start to feel like none of them are particularly special. Once upon a time, I could probably list every single Pokémon and around what level it evolved; the new ones might not necessarily be *bad*, but it's just overwhelming. If there are too many to memorize, then I feel like you're not really going to care about any of them. And also, personal opinion again, why not save Mew, and instead of obtaining him through an "Event" (which requires little more than downloading him), make him a reward for obtaining all other 150 Pokémon for your base Pokédex? As I said, include select Pokémon from the later series, but make completing those first 150 something really special.